Today's resignation of Perng Fai-nan marks the end of one of the longest terms of office for a central bank governor in the world. He took office during the Asian Financial Crisis and has experienced many extreme moments over the 20-year ride. Yang Chin-long, the current top deputy governor, will succeed Mr. Perng, signaling continuity in monetary policy. However, this won’t be a smooth journey. As an export-oriented economy, Taiwan is heavily dependent on external demand, especially that from China and the US. Notably, Taiwan runs a sizable current account surplus, which has exceeded 10% of GDP since 2013. Hence, Taiwan is on the watching list of the US currency manipulation report. As a result, the appreciation pressure on TWD has been mounting. Over the past two years, TWD experienced a 15% appreciation versus USD. The rapid appreciation has become a serious concern among exporters. The new governor needs to manage all the pressure from different stakeholders. Obviously, he can’t make everyone happy. Go short USDKRW and USDTWD Almost like clockwork, the combination of a weaker USD FX, higher commodity prices in common currency terms, and stronger US wage growth has translated into higher UST real rates and precipitated a liquidation/correction in risk assets. Over the past month, our EM Asia local market strategy has sought to prepare for such a correction by scaling back on OW in MYR FX and OW in INDOGBs, and raising UW on Thai government bonds in the GBI-EM Model Asia Portfolio. The above figure shows that the foreign holdings of NJA equities as a proportion of GDP. 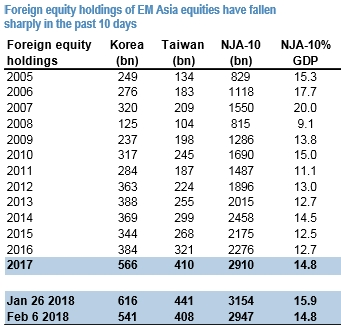 They had surged from an estimated 14.85% on 29th December 2017 to 15.93% on 26th January 2018, but at the time of writing are below the end-2017 level, with the largest pullback in Korean holdings followed by Taiwan. For the record, this ratio hit a local high of 20.05% of GDP in December 2007. Our strategic, multiyear, outlook still assumes a USD-based EM portfolio of 50% local-currency bonds and 50% equities to outperform a standard DM portfolio of 60% equities and 40% government bonds. We are taking the opportunity to scale into new short USDKRW and USDTWD positions whilst reaffirming our existing short USDSGD trade.